Tutto Pasta State Street is a family owned Italian Cafe style restaurant in the heart of Madison"s famous State Street area. We are located in a charming old building on the corner of Johnson & State Street. Come in and enjoy a wide variety of authentic Italian dishes & a happy, friendly staff. Our Tutto Pasta on State Street has been voted Best of Madison Top Three Italian every year since 2006! We have Healthy Pasta options along with GLUTEN FREE options that have become very popular. We also like to help people with allergies enjoy a nice meal out feeling safe! If you have an allergy, please let us know so we can plan for your meal. We have rooms we can use for groups of 30 or less and we are happy to work with you to make your event or meeting special! We create our pasta dishes individually with incredible sauces and fresh ingredients. We have a good selection of wines too and everything is reasonably priced! Juan Aragon & Jose Camilo Jr.
We have two rooms downstairs that hold 30 seats in each. On very busy days we use all these seats for customers but most weeknights these are available. We will do a special limited menu for your group if you want and will work with you to set all the details as you like. One of the owners, Pam, works with customers for group events to ensure we can provide you with a special evening and great meal. There are times when she can give you the room on a weekend so just give her a call if you want to talk to her about your needs and see if we will be a perfect fit! There are many places to park in downtown Madison. The parking garages are called Ramps and the one nearest to our restaurant is the Overture Center Ramp. Another one that is almost exactly as close is the State Street Capitol Ramp. There is also the Buckeye lot nearby as well. There are meters on the side streets also to park. If you go to the cityofmadison.com web site and go to the parking utility section you can click on the downtown map for parking. Downtown is fun! One Delicious & Beautiful Plate of Bruschetta, Calamari & Caprese! Great to Share Together! Tomato, basil, garlic & extra virgin olive oil on toasted bread. Baked eggplant with fresh tomato sauce, basil & Pecorino Romano cheese. Deep-fried, breaded mozzarella cheese served with fresh marinara sauce. Baby Squid lightly floured and deep fried. Served with a spicy tomato sauce. Delizioso! Fresh mozzarella with basil, tomatoes topped with extra virgin olive oil with Balsamic Vinaigrette. A combination of eggplant baked with tomato, basil & parmesan and a Greek Salad, smoked salad. Zuppe & Insalata - Fantastico Soups & Salads! Minestrone & Fresh Soup Special! Romaine lettuce, Kalamata olives, red onions, cucumbers, feta cheese & roma tomatoes tossed in an Italian vinaigrette with Oregano. Mixed greens, feta cheese, caramelized walnuts, sliced strawberries & grilled shrimp tossed in a balsamic vinaigrette. Sliced pears, mixed baby greens, walnuts & gorgonzola in a raspberry vinaigrette. Cut Grilled chicken in mixed greens with our homemade croutons & parmesan. Mixed greens, goat cheese, caramelized walnuts & Norwegian smoked salmon in a raspberry vinaigrette. A side of Marinara Sauce - Free! - All other sauces are Cooked Fresh for a Side so it takes a bit of time for us to cook them! $2. Add a side salad for just $3.25. Special Ones or Build Your Own Pizza! Toppings: Pepperoni, sausage, chicken, anchovies, tomatoes, onions, mushrooms, olives, bell peppers, zucchini, gorgonzola, goat, fontina cheese &/or Shrimp. Enjoy the Pizza you will love! Thin crust pizza with fresh tomato sauce, mozzarella, olive oil & basil. Thin crust with tomato sauce, mozzarella cheese, Italian sausage, mushrooms, bell peppers & gorgonzola cheese. Thin crust pizza with fresh tomato and pesto sauce, grilled chicken & mozzarella cheese. Thin crust pizza with Delizioso Marinara sauce, fresh tomatoes and fresh cut Meatballs. Thin crust pizza with mozzarella cheese and our homemade tomato sauce. Just the main one. Add a side salad for just $3.25. You may choose a different side pasta & sauce or soup or side salad. Breaded chicken breast lightly fried & baked with tomato sauce, mozzarella & parmesan cheese. Served with Penne Vodka. Chicken breast sauteed in a lemon caper cream sauce. Served with Penne Vodka. Chicken Breast sauteed in a delicious Marsala wine sauce with mushrooms and raisins. Served with Angel hair pasta tossed with sun-dried tomatoes, olive oil & garlic. Your choice of sauces, pizzaiola, marsala wine or lemon caper. Served with Penne Vodka. Grilled Salmon Filet topped with fresh tomato basil sauce. Served with penne pesto! Cheese Ravioli in a creamy, garlic, Alfredo sauce topped with sauteed mushrooms. Filled with a blend of ricotta, parmesan, asiago & mozzarella; sauteed with olive oil, onions, ham & baby peas in a light cognac tomato cream sauce. Jumbo tube pasta filled with ricotta cheese, baked in tomato sauce & melted with mozzarella cheese. Potato dumplings with tomato, pesto or bolognese sauce. Jumbo cheese ravioli in a fresh tomato basil sauce finished with Pecorino Romano cheese. Italian style risotto sauteed with shallots, baby spinach, asparagus & Pancetta in a creamy parmesan sauce. Ravioli stuffed with Lobster, sauteed in garlic & olive oil & your sauce choice - Vodka, tomato cream, Alfredo, pesto, marinara or checca! Ironman Inspired! Omega 3, multi grain pasta sauteed with garlic, onions, baby spinach & artichoke hearts in tomato basil sauce. Omega 3 Fussilli sauteed with spinach, pine nuts, zucchini, bacon & asparagus in olive oil garlic & your choice of alfredo or tomato cream sauce. Omega 3, multi grain pasta sauteed with olive oil, garlic, lemon, asparagus, and chicken topped with goat cheese. Omega 3, multi grain pasta sauteed with garlic, olive oil, basil & chicken in marinara sauce topped with melted mozzarella. Gluten Free Pasta sauteed with olive oil, garlic & options - Checca, Alfredo or Aglio sauce. No Dairy = no Alfredo! Includes side choices of salad, soup, pasta salad or fries. Meatballs in Marinara sauce topped with melted mozzarella & served open! Campari tomatoes, basil, mozzarella cheese & balsamic vinaigrette. Turkey, lettuce, fresh parmesan & sliced Roma tomatoes. Grilled Chicken Breast with bruschetta, lettuce, parmesan cheese & Balsamic glaze! Fantastico! Grilled Chicken Breast with onions, lettuce, tomato & Caesar dressing. Parmesan Chicken Breast lightly fried & topped with marinara sauce & melted mozzarella cheese. Add Chicken for $2.75 or Shrimp for $3.75. Add a side salad for just $3.25. Our signature dish! Favorite! Bowtie Pasta sauteed with onions, mushrooms, chicken & a splash of Frascati wine in a light tomato cream sauce. MadHatter Guy's idea! His style of Tutto Pasta that he loved is - Bowtie pasta sauteed with Sausage instead, onions & a splash of Frascati wine in a light tomato cream sauce! Large tube shaped pasta sauteed with onions, sausage, mushrooms & bell peppers in a light tomato sauce. Large tube shaped pasta sauteed with eggplant & mozzarella in a fresh tomato basil sauce & pecorino romano cheese. Corkscrew pasta sauteed with mixed garden vegetables in a tomato basil sauce. Angel hair pasta sauteed with a pancetta, onions, hot pepper flakes, tomatoes & parmesan cheese in our delicious tomato sauce. Spaghetti pasta sauteed with olive oil, onions, celery, carrots & Burgundy in a tomato meat sauce. With our delicious homemade marinara sauce! Large Tube shaped pasta sauteed with mushrooms, red & green bell peppers & chicken in a tomato basil sauce. Tube shaped pasta sauteed in a spicy tomato basil sauce. Tube shaped pasta sauteed with olive oil, & vodka cream sauce. Tube shaped pasta sauteed with chicken, asparagus, spinach & pepperoncini in a creamy tomato sauce. Organic whole wheat angel hair pasta sauteed with garlic, onions, baby spinach, asparagus & artichoke hearts in tomato basil sauce. Name after my Italian Friend! Wide flat egg pasta sauteed with olive oil & onions in a vodka tomato cream sauce & Mozzarella cheese. Corkscrew pasta sauteed with mozzarella in tomato basil sauce. Angel hair pasta sauteed with mushrooms, mozzarella, tomato & basil. Bowtie pasta sauteed with olive oil, onions, fresh Atlantic & Norwegian smoked Salmon in a vodka tomato cream sauce. Sauteed with calamari, manila clams, black mussels, Atlantic & Norwegian smoked salmon, baby & tiger shrimp a light spicy tomato Pinot Grigio sauce. We have healthy pasta substitutions for only $2! Omega 3, Organic, Wheat, Angel Hair & Gluten Free! Fancy pasta subs - Gnocci & Tortelloni, $3! Sauteed with parmesan & cream sauce. Sauteed with broccoli & sundried tomatoes in a white wine cream sauce. Wide flat egg pasta sauteed with grilled chicken, mushrooms, onions, bacon & artichoke hearts in a Pinto Grigio Cream sauce. Tube shaped pasta sauteed with gorgonzola, fontina, mozzarella & parmesan in a light cream sauce. Tube shaped pasta sauteed with chicken, pistachios, zucchini & dried cranberries in alfredo sauce with mozzarella cheese. Fresh lemon pepper pasta sauteed with chicken in a creamy alfredo, lemon basil sauce. Large tube shaped pasta sauteed with chicken breast & mushrooms in a creamy sauce. Sauteed with baby & tiger shrimp in a Frascati cream sauce. Tube shaped pasta sauteed with chicken in a homemade Genovese style basil pesto sauce topped with a bit of chopped tomatoes. Sauteed with Pancetta in a white wine, egg & black pepper reduction sauce & topped with pecorino romano cheese. The food is amazing and the service is outstanding. Fanatic food, ambience, service - lovely time. Manicotti, meatballs, spaghetti Bolognese, Appetizer platter and tiramisu were fantastic! A friend we haven’t seen in years was in from CA and we decided to meet in Madison (the middle for us) for dinner. Since we’re not from the area we haven’t been to Tuttos in years. Our last experience was tasty. This time not so. My pasta was under cooked. My husband ordered scampi and was served chicken. Our friend just smiled and ate his food. Maybe his truly was fine, or just too polite to complain to us. The only shining star on the table was the bread they served - it was very good? Disappointed to say I doubt we’d go back or recommend to anyone. The three hostesses we approached were cold and confused. We waited twenty minutes past our reservation time, while watching multiple parties cancel their table with the hostesses after waiting too long. All three hostesses disappeared for about ten minutes, too, which caused mass confusion. When we were ultimately seated, our experience improved a little. Our waiter was kind and quick. The food was good. We were missing silverware at our table, which was also not completely cleaned after the last diners. The restroom was a disaster. Waited for 40 minutes to be seated for our reservation. Multiple later reservations of similar size were seated before us. They really need better coordination between wait staff and front of house. The restaurant was great. The service was fast even at a busy time. The portions were large and the food tasted great. Pre theatre dining. Great place to enjoy Madison people watching outdoors with a pitcher of Mango Sangria. Friendly staff, great bread, great lunch/dinner specials. Food was great but soda came from a half empty, plastic two litter bottle? Flat, warm, shocked that we were actually served that!!!???!!! Doubtful we will be back but if we do...water, please. We considered ourselves lucky to find a table for six on a busy graduation weekend. We were seated quickly, the food was great and the staff was very helpful when my wife left her purse behind and we had to return to pick it up. We had a party of 12 for my sons Graduation lunch/dinner. They had a great table set up for us in a private nook upstairs. We had amazing service, the food was great, and we could all hear each other in the space. Plus it was great food and wine ! My original reservation was for 8, and 2 weeks before I asked if it could be increased.. the manager I spoke with was amazing, and said he would make it happen. It was a great experience, and we will be using Tuttos for all of our Madison party needs ! Great food and very professional service! Amazing and relaxing! It’s definitely quieter upstairs, really nice for a date! Very nice staff, extremely customer responsive - food prepared to your liking and a great location and value - dinner for 5 with a few drinks and an app = $100 ! Always great food but it is very loud and hard to hear inside the restaurant. The food makes it worth it though! Busy as expected on a Friday evening. Seating space is small, tight and limited so glad we made a reservation. Food was really good with no complaint. Service was a bit lacking due to how busy it was. Our food arrived before our drinks and our appetizer we ordered was never placed for us. I’d come back but maybe I’d pick a different day/evening. A great little Italian restaurant. Great food and easy to get to. The staff was great and the food, splendid. I recommend it. Be prepared to take some home with you because the servings are generous...and delicious. Tutto Pasta has been a favorite for many, many years. This is the first visit since over a year when we had terrible service and food (never received drinks, appetizers, refills, food was improperly prepared, waiter kept forgetting basic service--water, bread, incorrect orders). I am pleased to say, this time was much better! Same waiter has learned from his mistakes and poor quality service. Drinks and appetizers arrived in timely manner, water refilled, food prepared exactly correct and hot! We are from out of town and this was our fIrst time there based on many recommendations. Really looking forward to it! We were seated in a hot corner of the basement on a table meant for a large party. There were also 2 rather large parties going on next to us-so very loud. Had a nice waiter but not the greatest service as we felt rushed out of there. He also forgot one of our dinners. Dessert was not even presented and we know they had it cause the tray was displayed for the large parties next to us. Fell in love with the tables and quaintness of the place-never dreamt we’d be seated in the basement with no ambiance. Sad experience. It was a really good meal! They put me at a very inconvenient table, but the server gave me a free dessert even though I did not complain. He provided exceptional service. The seating is a little all over the place, but the food was fantastic! It came out quick and hot which is a huge plus. Also, the prices were very good for the large plate of pasta I got! The food tastes fresh and homemade! This is a hidden gem in Madison. 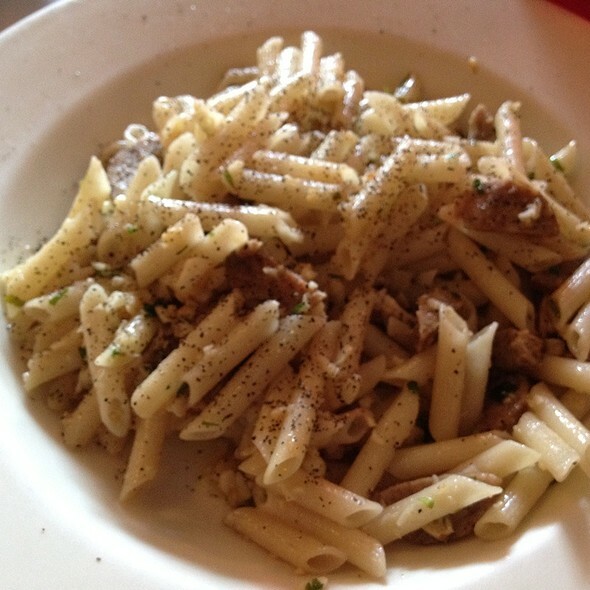 If you are just looking for some good causal Italian food, come to Tutto Pasta! Was disappointed. 20 mins before the waiter took our order and we were in a bit if a hurry to get to a show. The appetizer was good, but the food was only ok and the service was very sloppy. Left leaving most of my entree. Great food and service for the price. The only problem is using the small bathroom. An absolutely fantastic place. Crowded, as always, but part of the charm of a genuine State Street institution. They never disappoint. Highly recommended. We were in town for the WIAA high school basketball game and went to Tutto Pasta with our two kids (ages 7 and 13) and my nephew and fiance. The atmosphere was fun, our server was great and the food was delicious! My boyfriend loves Italian food and had never been there, so I HAD to bring him!!! We had a great time. The food was wonderful as was the service. They overheard someone say they had to hug me because it was my birthday. At the end of the meal, I got a piece of cake and a candle in it. The server sang happy birthday to me. The food and service was great! However, it was extremely crowded and noisy. The wait staff could barely move between tables. Our “ postage stamp” table for 2 should have been a table for one. Barely big enough to hold our entrees let alone the bread basket and drinks! Many tasty pastas. I usually order the Norma which features eggplant. We were seated quickly at 6:30 pm on the ground floor. Lighting was a bit bright, but ambiance was what we consider very traditional Italian decor and clean. Our waiter was very pleasant and quick to greet us and get our beverage order, and our drinks were very affordable. Surprisingly large wine menu for a less expensive restaurant like this. We ordered one special (a lemon pasta w/ chicken) as well as the penne peperoncini for our entrees. Between the two, the peperoncini was definitely the winner; not too rich, but very flavorful. Spicy, but not overwhelming. Balanced and delicious. Our bill was very reasonable, and although the restaurant got much busier by the time we left and our waiter got held up a bit, we had a nice two-course meal at a leisurely pace in ~1 hour and 15 minutes. Definitely recommend this solid Madison institution. Worth checking out for sure. Good food and service. We sat upstairs and the heat was unbearable. We couldn't wait to get downstairs to the bar. It was just okay - I expected something a little better for the price. Kind of non-descript food. Attentive service of bland food (Chef's special) in a cramped room. Competitive pricing, great location, and excellent service compensate for an indifferent menu that may appeal to customers who recoil from authentic flavors. We had an OK experience but don't recommend this restaurant. The food was passable but expensive for the quality. I would not plan to return here. A pre-theater dinner with friends. I've eaten here before but my husband and the other couple hadn't so they didn't know what to expect. We all loved the whole experience. Our food server was incredible and even sang 'Happy Birthday' to my friend. <3 The food was incredible! I will definitely be back and bring new 'foodies' with. Love Tutto Pasta! Great food and great place to go before Overture. Worst bread I have ever had at a restaurant. Drinks were good and reasonably priced. Hard to mess up pasta and the dishes were ok but uninspired. Great location if you are going to the theater but not a restaurant I would seek out just for the sake of eating there. There are so many better restaurants in the area.